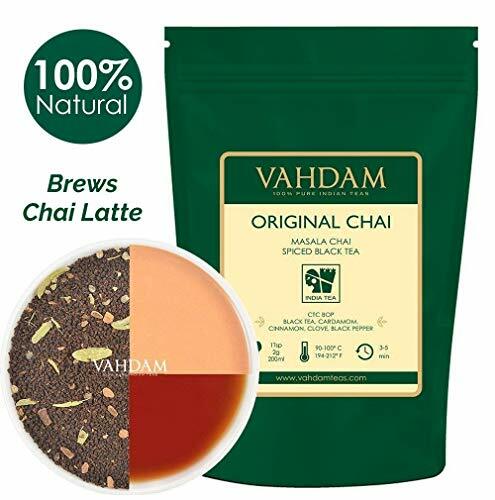 Widely distinctive from the Chai tea blends produced in western countries, the VAHDAM original Indian masala chai tea blend stands out due the superior and distinctive properties of spices grown in India. This strong and full-bodied tea is characteristic of an exotic flavor of fresh cardamoms combined with delicate notes of cinnamon, black pepper and clove. Traditionally prepared only with milk, this Chai tea can also be served straight. INGREDIENTS - This Loose tea contains carefully mixed proportions of Assam CTC organic chai tea and spices like crushed Cardamom pods, Cinnamon, Cloves & Black Pepper. This spiced chai tea has Rich flavor and has health benefits like detoxifying the body, boosting immunity & improving digestion, thus making it both an ideal digestive tea and a weight loss tea. This Indian Traditional loose leaf tea contains 100% natural ingredients and can be served as milk tea as well. DIRECTLY SOURCED - Tea leaves are vacuum sealed & packed within 24 to 72 hours of harvesting to give you Garden Fresh Tea with the Best Aroma & taste, and the assurance of truly ethical, fair trade price to Farmers. ETHICAL, DIRECT & FAIR-TRADE- TRULY - Our innovative supply chain model ensures you get the freshest cup of tea and our farmers get a better price for their produce. 1% of our revenue is redirected towards the education of our tea growers' children. Our farmer s, like any other parent, wish for their progeny to have a better life than them. We at Vahdam Teas with our social initiative, TEAch Me, simply wish to honor this aspiration. If you have any questions about this product by VAHDAM, contact us by completing and submitting the form below. If you are looking for a specif part number, please include it with your message.